ENO DoubleNest LNT Special Edition Hammock. The DoubleNest reigns supreme. It's ENO's bread-and-butter. It's your all-access pass to relaxation. Big enough for two and palatial for one, the DoubleNest still manages to stuff easily into its attached compression sack. Take it anywhere, set it up in seconds flat, lay back and Oh, did you want to join me? I've got room for one more! 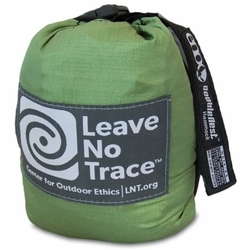 The most recent Special Edition Hammock, ENO welcomes the LNT™ DoubleNest in an effort to support Leave No Trace Center for Outdoor Ethics’ efforts providing education to preserve our natural world. $10 from the sale of every LNT DoubleNest Hammock goes straight to Leave No Trace to help preserve and protect our outdoor world. For more, check out: lnt.org. Eagles Nest Outfitters.